This genus is accepted, and its native range is China, Sakhalin to Japan. Perennial. 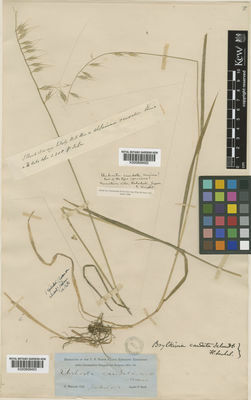 Rhizomes elongated. Culms erect; 20-70 cm long. Leaf-sheaths tubular for much of their length. Ligule an eciliate membrane. Inflorescence composed of racemes. Racemes single; paucilateral; bearing 10-20 fertile spikelets on each. Rhachis angular. Spikelet packing distant. Spikelets pendulous; solitary. Fertile spikelets pedicelled. Pedicels linear. Spikelets comprising 2 basal sterile florets; 1 fertile florets; with a barren rhachilla extension. Spikelets cuneate; laterally compressed; 12-15 mm long; falling entire; deciduous with the pedicel. Rhachilla internodes elongated below proximal fertile floret. Glumes shorter than spikelet; thinner than fertile lemma; gaping. Lower glume lanceolate; 0.8 length of upper glume; herbaceous; 1-keeled; 3 -veined. Lower glume apex acuminate. Upper glume lanceolate; 0.5 length of adjacent fertile lemma; herbaceous; 1-keeled; 5 -veined. Upper glume apex setaceously attenuate. Basal sterile florets barren; without significant palea. Lemma of lower sterile floret lanceolate; 0.66 length of fertile lemma; coriaceous; 5 -veined; acuminate. Fertile lemma lanceolate; coriaceous; keeled; 5 -veined. Lemma apex dentate; 2 -fid; awned; 1 -awned. Principal lemma awn from a sinus. Palea keels approximate; ciliolate. Caryopsis with adherent pericarp; ellipsoid; apex umbonate. Hilum linear.